A long read, but, imo, interesting. Libertas, that Gordon Caplan isn't the only 'real peach', judging by this article. Oh no...I know, he certainly is not, for the article I linked though his had some of the most psychotic quotes in it. Re: Your link, yeah, good stuff...no surprise she has a literary background, well written with a sweet but biting flair. I approve! "...listening to rich people complaining bitterly about an “unfair” or a “rigged” system"
Dear Lord is that rich! "That so many of them were (literal) limousine liberals lent the meetings an element of radical chic. They were down for the revolution, but there was no way their kid was going to settle for Lehigh." Frauds, always have been. Toxic selfishness, the hallmark of all elitists. "Worst of all, the helpless kid would be sitting right there, shrinking into the couch cushions as his parents all but said that his entire secondary education had been a giant waste of money." Their kids are extensions of their ambitions and status symbols to lord over others, period. "...the horrible parents constituted at most 25 percent of the total"
I reckon that has increased a bit over the years. This case seems to indicate the demand for criminal scheming has blossomed to critical mass. Sports? Timed testing? The silliness of essays and activities we can dispense with for now, but anybody thinking sports wasn't a good avenue full of opportunities haven't been paying attention, NCAA rules aside (they catch a few fish after the fact...long long after the fact...and only for violating their rules) this case has blown open the doors of a much larger culture of greed, corruption and criminality than most casual observers could have imagined. In the end it was this same selfishness that brought them down, rats caught in one trap wanted desperately to wiggle free and ratted out others in their circle running scams. Caplan - "I’m not worried about the moral issue here..."
This is key...these people do not have an "entitlement" complex...they know they are the entitled. Loughlin and her dirtbag hubby show how insane this mentality is, it overrides any concern for their children's hopes and dreams and now they have been outed as the spawn of liars and cheats. That the smaller pie has crunched on this entitled class is no surprise nor are the reasons for it (reasons that reside in the PC/Diversity/Multi-Culti Cultists as much as anybody's! ), and not making the cut and settling for less isn't the egalitarian equality those down with the struggle can accept, that's for lesser folk, lesser financially and culturally. They helped create this society, now they are exposed for the narcissistic assholes and frauds they've always been...and their kids take the brunt. The description of the raid on Huffman and the anti-Trump diatribe I suspect was not far at all from the truth. These people are despicable, we've know it all along...maybe now a few more do as well. 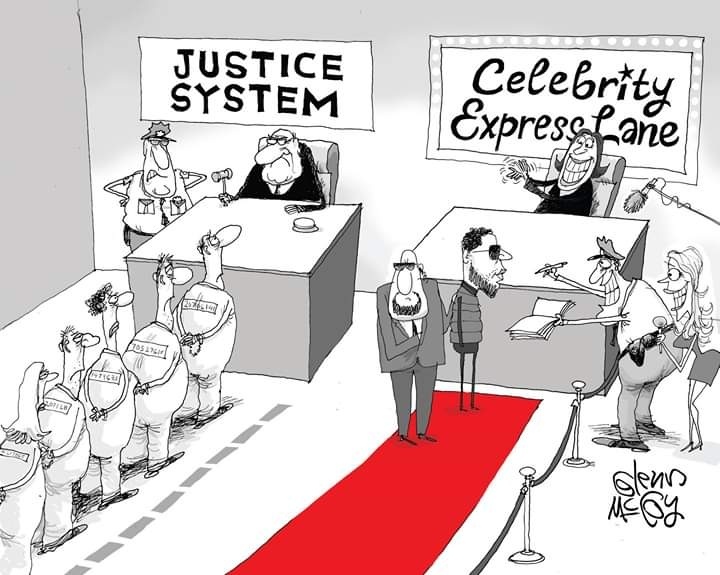 Yeah...well...we shall what kind of "justice" unfolds, won't we?